To create a Quick Price Quote: Click on Sell This Vehicle, on the vehicle screen. 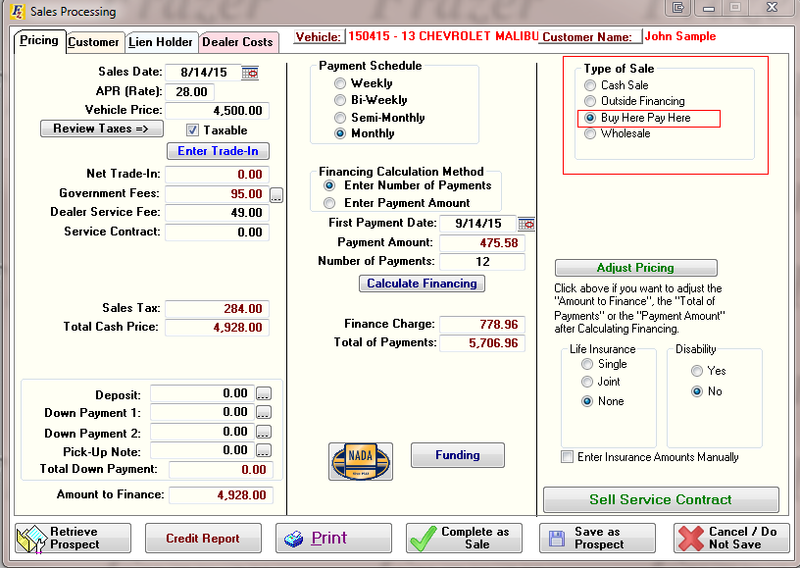 Pricing & Fees - Enter your pricing information (APR, vehicle price, fees, financing etc) on the Pricing tab. Sales Recap - On the Dealer Costs tab, Click the Sales Recap button and review all the fees and income on the Sales Recap report, taking special notice of the Profit and original cash position. Make Adjustments - Based on that review, make any changes to your pricing and fees on the Pricing tab that may be needed to show a profit. You may also need to adjust your Vehicle and Added Costs, and any back end Dealer Costs associated with the deal. Pricing Recap - When you are satisfied that you have a viable quote, add the customers information on the Customer tab, print the Pricing Recap for your prospective customer by clicking the Print button at the bottom of the Sales Processing window. Save the Prospect - Remember, you can save this quote for later by clicking the Save As Prospect button when you are finished.